There is so much discussion regarding the benefits of glucosamine for dogs. Everyone knows that it is great for dogs with osteoporosis, hip and joint dysplasia and arthritis, but are you aware of the benefits of glucosamine in promoting healing? Studies have indicated that glucosamine may be rate limiting for the body's hyaluronic acid synthesis and that the supplementation of glucosamine following surgery or trauma may increase hyaluronic acid production in the wound and encourage more rapid healing and diminish scarring. Did you know that the two major building blocks for cartilage synthesis is Glucosamine and Chondroitin. Glucosamine is responsible for the synthesis of hyaluronic acid and glycosaminoglycans within the joint. Chondroitin, while being one of the major gylcosaminoglycans, also acts to inhibit degradative enzymes that promote the breakdown of cartilage. These two important building blocks of cartilage in your dog break down with age. The incidence of degenerative joint disease increases with your dog's natural aging process. Mickey's Pet Supplies- a natural pet store- carries easy to feed dog treats that make it so easy to give your dog the much needed glucosamine and chondroitin. Wholesome Hide Happy Hip Chunkees are great tasting treats made by the made in USA certified Wholesome Hide. 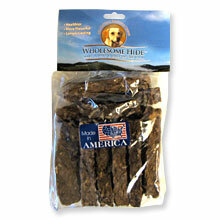 These treats are made of ground, fresh rawhide formed into a 3 inch breakable treat. They are fortified with 500 mg. of glucosamine and 200 mg. of chondroitin. Zuke's Hip Action treats are a soft and chewy treat fortified with 300 mg of glucosamine and 50 mg of chondroitin. They also contain essential cofactor vitamins and minerals that aid in absorption. They are wheat and corn free and available in Chicken, Beef and Peanut Butter flavor. Find only the best healthy and natural treats for your dogs at Mickey's Pet Supplies. Free shipping on your $75 order. Mickey's Pet Supplies is a family owned business that truly cares about our customers.